One of my favorite summertime meals is an oven-baked (or grilled, if you’re lucky enough have a grill) aluminum foil fish packet. Making fish packets is a virtually foolproof process — perfect for the weeknight budding chef. Place ingredients in a large square of aluminum foil. You’ll want a thin white fish filet — I’d recommend cod, haddock, swai, tilapia or the like — with a few veggies (green beans, sliced carrots, and broccoli hold up well), seasonings of your choice, and a small amount of liquid. Broth or a dry white wine are delicious; a drizzle of olive oil or a few slices of lemon also add a nice touch. NOTE: To fold your packet, either A) Take a “modified present-wrapping” approach by folding the sides together, then crimping the ends until sealed; or B) Wildly crimp the edges together as tightly as possible. In both cases, leave some room for air / steaming. Go-go gadget packet! OTHER NOTE: No, you do not have to roast an entire fish. #creepyeyes #dinnerwithaface? Cook on the grill over direct heat, moving to a higher rack (for indirect heat) after 10-15 minutes of grill time. Alternatively, bake in a 375°F oven for 25-30 minutes, or until fish is opaque and flaky and the veggies are cooked to your liking. Open your foil packet and dig into that beautiful fish filet! Here’s one I whipped up recently for THT and myself — I tucked green beans and a pea-carrot-corn blend into a packet with a tilapia filet and added olive oil, lemon juice, and dried dill. 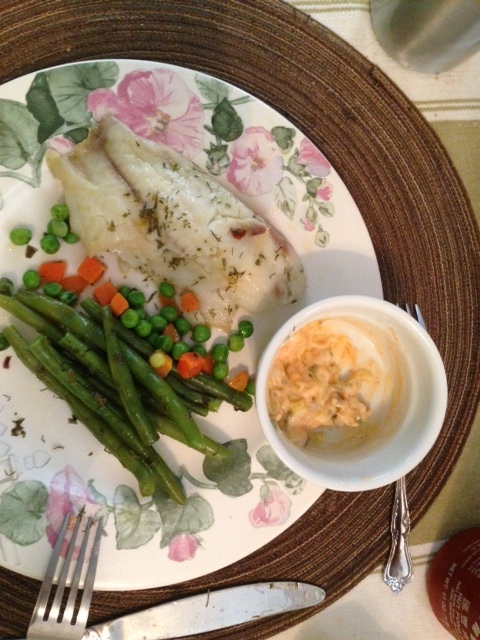 I garnished the fish with a Homemade Sriracha Tartar Sauce, which couldn’t be simpler to make. 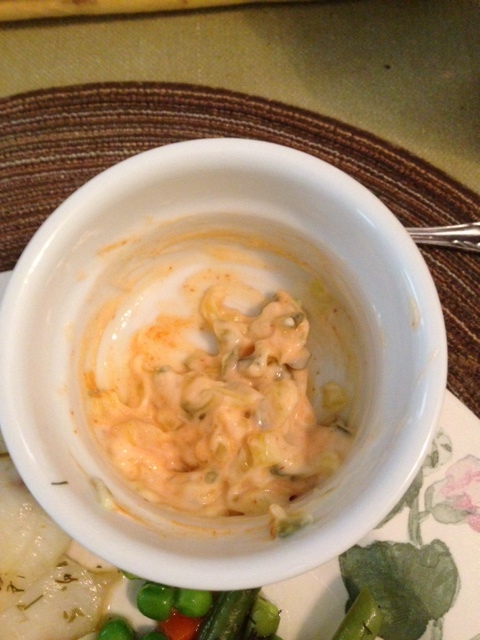 Sriracha Tartar Sauce — makes 1-2 tbsp. Combine all ingredients in a small bowl by stirring with a fork. Taste test the sauce to determine just how spicy you like your condiments. Enjoy! This is also delicious on a fish sandwich or mixed with a can of tuna. Do you lovely folks every make fish packets for supper? How do you concoct yours? What are your go-to veggie-and-fish combinations? Seasoning preferences? Feel free to share in the comments! This post is participating in Homemade Ginger’s Jamboree. Check out more fabulous links here! Thanks to Megan and her fabulous blog for the chance to share this month. Glad to have you back! Missed the blog. Love you! Welcome back! This sounds great, I think I’d like to try it with Broccoli and cauliflower. I love the dill on fish and in lots of salads. I love cooking fish in parchment/foil. This looks delicious!